Happy Wednesday everyone! And more importantly, happy birthday to my daddy! I'm so glad I got to go out to New Mexico earlier this month to surprise him but I wish I was out there today to celebrate. But with Christmas being two days away I'm stuck here trying to make sure everything has been delivered, wrapped and ready to go to Gainesville on Friday. Since I have to work tomorrow I'll probably be rushing to get everything done but oh well. That's what I get for letting the holidays sneak up on me! Speaking of the holidays, when trying to figure out my Christmas outfit this year I realized it was going to be 85 degrees on Christmas so dressing warm isn't really a necessity. So instead I decided to take full advantage and break out a cute holiday skirt and pair it with a festive plaid button up. The plaid makes me feel at least a little fall/winter like but the fun red midi skirt dresses things up a bit while still keeping me nice and cool. I've been wearing this plaid top on repeat since I bought it. I love the slouchy boyfriend fit and the material is the softest material ever! I topped off my look with some strappy heels and a fun gold, sequin clutch because there's not better time than the holidays to sparkle a little! I hope everyone has a fabulous Christmas! So festive and fun! I can't wait to dress up for Christmas Eve! This outfit is jaw-dropping gorgeous on you!!! Love it!! Obsessed!! So perfect for this 70 degree Christmas that we are having in NC!! I am in LOVE with this look, lady! So perfect for a warm Christmas time. I need to recreate it for our Christmas this year! Merry Christmas, friend! ok you look super chic here. very audrey and i'm digging it :) brb while i steal that shirt ;) merry christmas friend!!! You look so beautiful! I love how you elevated the look of your plaid by adding that amazing skirt..it has such a beautiful silhouette and you paired it with the perfect heels! Have a Merry Christmas! Can't even believe it's going to be 85 degrees for you guys! This is the perfect look though - so pretty and festive! Have a Merry Christmas, girl! You look absolutely gorgeous! I just love this look on you! Merry Christmas girlfriend! This is THE cutest Christmas look ever! I love it so much! How was the ordering with Chicwish? Looking absolutely STUNNING! I love everything about this outfit--especially that skirt! Have a very Merry Christmas!! Really cute and festive for the holidays. I wish i could pull of a skirt or dress like that. lol Especially digging those earrings!! happy birthday to your daddy! 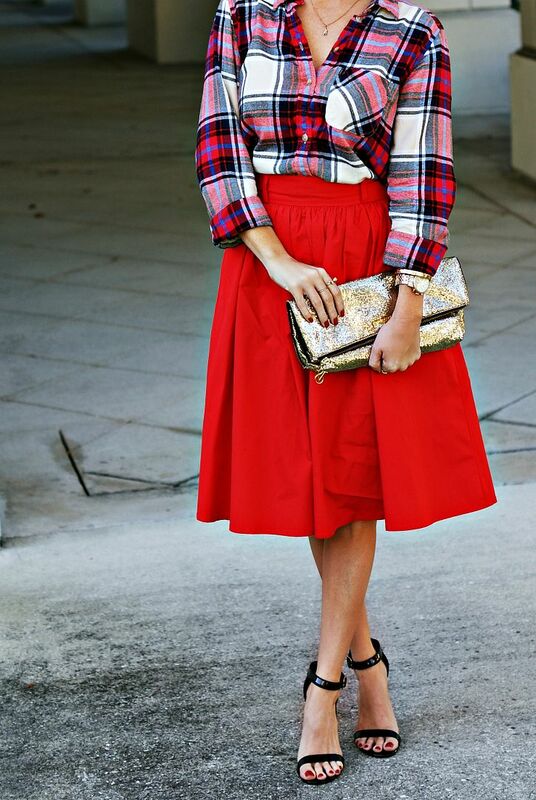 this skirt is so fabulous and i love how you paired it with the plaid and the fun red lip. gorgeous! Too cute!! Such a fun and festive look! Love that skirt and the plaid paired with it is perfect! Have a Merry Christmas!! this is just the cutest!! it makes me want to twirl! happy birthday to your dad! I love everything about this outfit! You look adorable! So gorgeous and festive. Seriously, holiday outfit goals!! Talk about the perfect outfit for a warm and balmy Christmas! I like how the plaid still feels like Christmas, but with the skirt and sandals, you'll still be comfortable with the hotter weather! Hopefully the rest of your week goes quickly and you have a fabulous Christmas! That skirt looks so fab on you. I love a good solid red piece and the flare of that skirt is perfection! You look stunning! That skirt is so fun! I love this plaid! Great outfit! Stunning look! Love this outfit and the colors are amazing. I love this look so cute! So pretty paired with the red lips too! I saw this last week but just didn't have a free second to comment - I AM OBSESSED WITH THIS OUTFIT! Seriously, you look gorgeous and this whole thing is holiday/winter perfection. I need all of it in my closet!